However Marie O’Connor, spokesperson for a symphysiotomy group, described the grants as “an official whitewash”. THE GOVERNMENT HAS awarded just under 400 women thousands of euros in compensation each for symphysiotomy procedures they received. 399 women have received payments of either €50,000, €100,000 or €150,000 under a grant payment scheme that women applied for – with the payments totalling €34 million. Their medical records were checked and a judge awarded the payments to those who had undergone the procedure. Of the 590 applications received, 185 women were unable to establish their claim. The majority of women who applied were over 75 years of age – with the oldest claimant 96 years of age. Symphysiotomy was carried out on an estimated 1,500 women in Ireland up to the 1980s, long after it was discontinued in other jurisdictions. The controversial operation involved cutting the cartilage of a pregnant women’s pelvic bone – or breaking the bone itself in some extreme cases – to widen the birth canal. Many women subjected to the procedure were left with long-term medical difficulties, including incontinence and chronic pain. Minister for Health Simon Harris, said that they had expected to receive 350 applications for the scheme, but the actual number was much higher (approximately 590). He said that he hoped the payments, totalling €34 million, would work towards bringing “closure for the women involved and their families”. The ‘Surgical Symphysiotomy Ex-gratia Payment Scheme’ was approved by government in November 2014. Judge Maureen Harding Clark was appointed independent assessor to the scheme which was aimed at women who underwent a surgical symphysiotomy or pubiotomy in the State between 1940 and 1990. Pubiotomy involves sawing through the pubic bones and using a surgical instrument. Only one application in respect of pubiotomy received compensation under this scheme. One woman was offered compensation but refused in order to continue litigation against the state. The compensation is given under the condition that claimants discontinue any legal action. 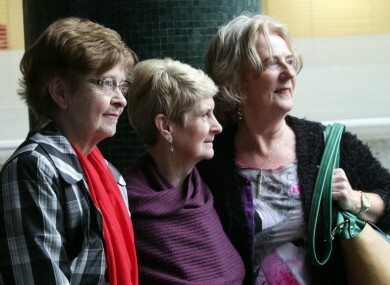 Campaign group Survivors of Symphysiotomy previously voiced their opposition to the scheme and encouraged women to continue with any legal proceedings. Marie O’Connor, spokesperson for Survivors of Symphysiotomy, described the grants as “an official whitewash”. She added: “The Harding Clark Report on the government payment scheme is the third official whitewash report on symphysiotomy. Nearly 200 applications were rejected by the scheme. Radiological evidence was used to exclude, although such evidence was, by definition, imperfect, if not downright unreliable, as proof of surgery and/or injury. She went on to say the scheme disproportionately favoured younger women, as older women’s doctors were more likely to be deceased and so evidence that they underwent the procedure is more difficult to obtain. Email “State apology: 399 women given up to €150,000 each for symphysiotomy procedures”. Feedback on “State apology: 399 women given up to €150,000 each for symphysiotomy procedures”.